Licenses are fairly inexpensive and run around $5 - $15 for a 10 day or annual license for NC residents, and $10 - $30 for a 10 day or annual license for out of state residents. Fishing licenses are administered by the North Carolina Wildlife Resources Commission (NCWRC) and can be purchased online before an OBX vacation at http://www.ncwildlife.org/. Licenses can also be picked up in person at local Kitty Hawk tackle stores, such as Bob's Bait and Tackle, TW's Bait and Tackle, Dock of the Bay, and even Wal-Mart. Fishing is allowed throughout the town of Kitty Hawk, although surf fishermen may want to avoid lifeguarded public beaches where there are plenty of visitors in and near the water. 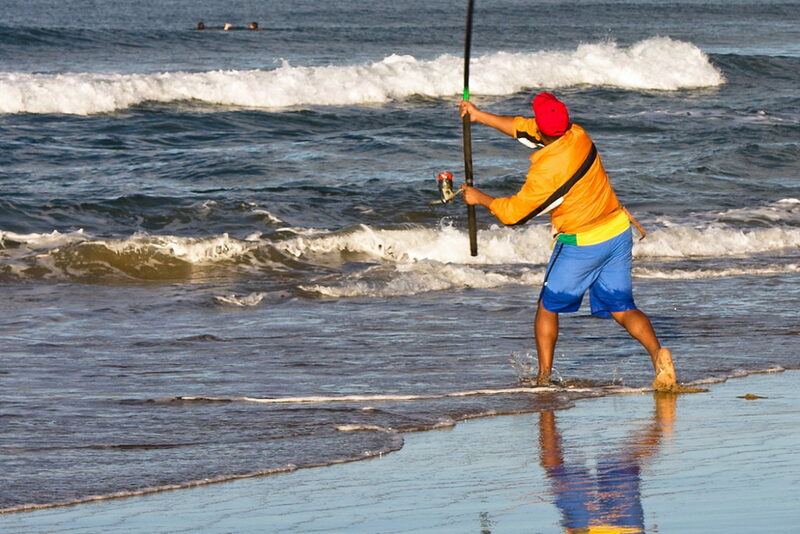 Fishermen should not cast out next to ocean swimmers, and a saltwater fishing permit is required for surf fishing. Note that pier fishing and charter fishing does not require a license, as these businesses typically carry a blanket license that covers all parties. The NCWRC also has season and size limits for all North Carolina catches. Details on individual species can be obtained online at http://www.ncwildlife.org/Fishing/SeasonsLimits.aspx, or visitors can request a current Regulations Digest by calling the NCWRC directly at (919) 707-0391. The types of fish an angler can catch depends completely on location and season. On the Soundside: Anglers in the Albemarle Sound, Currituck Sound, and in Kitty Hawk Baycan often reel in sheapshead, small mullets, largemouth bass, flounder, and plenty of shellfish including clams and crabs. Anglers can access these waters via the public boat launch at Bob Perry Road, or can rent their own fishing vessel or kayak to head out to the open sound through local watersports companies like the Promenade Watersports Center in Kitty Hawk. On the Oceanside: Anglers will find smaller catches, like spot and croaker, lingering just offshore along beaches that feature wide shallow sandbars. Larger species can be caught in deeper waters, along beaches that have more of a drop-off. Most anglers attest that the fall and spring months are the best times to cast, when the red drum are running, and a wealth of species can be reeled in including sea mullet, bluefish, sea trout, and even sharks. Atlantic fishermen can also head to the Kitty Hawk Pier, which is now owned and operated by the adjacent Hilton Garden Inn, and is open from 8:00 a.m. until 10:00 p.m. (Note that rates are less for Hilton guests, and the pier may be closed for private parties and events.) The Avalon Fishing Pier in neighboring Kill Devil Hills is also a good destination for anglers. The Outer Banks is known for its longstanding and nationally renowned fishing tournaments, and Kitty Hawk visitors will be close to a number of large offshore and surf fishing competitions which have become annual traditions. Offshore, the Big Rock Blue Marlin Tournament takes the cake as the largest NC fishing tournament, with prizes that range in the hundreds of thousands of dollars. Pirates Cove Marina in Manteo also serves as the home base for a number of offshore tournaments, including the women-only Alice Kelly Tournament, and the always popular Pirates Cove Billfish Tournament. Close to the beach, visitors can check out Jennette's Pier in Nags Head, which hosts several competitions designed for young anglers. Hatteras Island, located about 40 miles north, is also a Mecca for surf fishermen and is home to the annual NCBBA Red Drum Tournament, CHAC Invitational Tournament, and the 4-Plus / Capitol City Surf Fishing Tournaments. Kitty Hawk anglers can stop by any local tackle shop or marina to find out what upcoming tournaments are accepting applications, and / or are wide open to the public. There are a handful of inshore fishing charters that launch from the soundside of Kitty Hawk, and anglers interested in renting their own vessel can do so at local watersports companies, like Promenade Watersports, which is adjacent to the Wright Memorial Bridge. The majority of offshore charters on the Outer Banks launch from the massive marinas located in Wanchese, Oregon Inlet, and Hatteras Village, which are located approximately 30-75 minutes away for Kitty Hawk vacationers. Reservations are best made well in advance, as while the Outer Banks has literally hundreds of charter boats to choose from, fishing trips are always in high demand. Most charter fishing trips can accommodate 1-6 anglers, with rates that vary from $250 to $1500, depending on party size, targeted species, and targeted area. Offshore charter fishing trips to the Gulf Stream are generally more expensive than inshore fishing trips that stay close to the Albemarle Sound and Currituck Sound waters. Fishing trips may be cancelled due to weather, (with many local businesses offering make-up charters), and last-minute parties of 1-2 can also call and ask to "hop along" an existing scheduled trip. For information on reputable charter businesses and availability, anglers can often contact the marina directly, like the Oregon Inlet Fishing Center just south of Nags Head, to see what's biting and to reserve a spot.